Youth in Ministry – More and more I am hearing the greatest need in youth ministry is ministry involvement or connection. As Eldred puts it, “as professional youth ministry has increases, youth in ministry has decreased. Whether it is through intergenerational ministry or allowing youth to play a bigger role in the student ministry itself, the students need a connection and cannot be sitting on the sidelines any longer. Relationships – A common thread throughout the book was relationships. Amen! God has really laid on my heart to get out of my office and build relationships. And this book only confirmed what God was already telling me. This generation is seeking real relationships, not over-the-top events. The book makes the point that just as the armor wouldn’t work for David, “old-school” program driven youth ministries are not doing the job. Practical – I have already made a sheet to keep me accountable for connections as suggested in the book. Also, I will be working on getting each student plugged into the student ministry somehow. This was some good motivation to get them involved and showed (although not step-by-step) how it can be done. 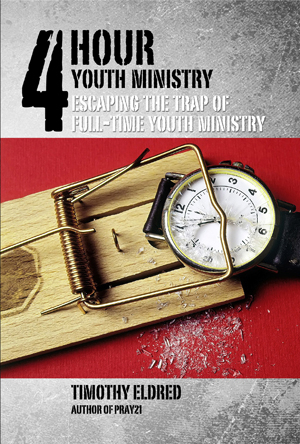 “If a dead bolt was placed on the youth room door and you were not allowed to have large group meetings, events, or activities for 6 months, what would your ministry look like?” OUCH! That hit me right between the eyes. “Ephesians 4:12, “Prepare saints for the work of the service.” Not prepare services for saint”. AMEN! Is it possible? – Apparently their youth group is entirely youth driven. Every event, meeting time, worship time…it is led by teens. Now, could teens do these things, absolutely! But I love to teach…what happens. Can there be a hybrid of letting teens do majority of ministry, while allowing adults serve in ways they are called and gifted? Grammar – Now I’m not a fan of the grammar police, probably because I get ticketed quite often myself, but this isn’t a blog we are talking about here. Get the man a proof-reader up in here! Once or twice is fine, but it was consistent throughout the book. Listen, I read this is one day. Now that is my type of book. Just give it to me and tell me what to do! And this book does a great job at doing those things. I’ve been saying for some time now, my goal is when I am missing, that I am not missed or that I am working myself out of a job. This book teaches and encourages that very thing. I made the promise, “to never do anything for young people they can learn to do themselves”. I’m fired up to go equip and let my youth ministry be characterized by youth IN ministry. It’s interesting, 3 years ago, I have to admit as a Ohio State fan, that Tim Tebow and Urban Meyer were not in my top 10 most liked people. Now, Urban Meyer is the new Ohio State football and recruits are flowing like milk and honey. And Tim Tebow is using his recent success as a platform to exalt the name of Jesus Christ. My, how things have changed in my mind. But enough about how I feel, what about the media, what about the national mindset…Well, as you probably know, recently Tim Tebow’s success has gained national attention. In fact, Saturday Night Live even dedicated a sketch to ridicule his outspoken Christianity. So why is Tim Tebow so polarizing? Would there be such hatred for the man if he wasn’t a Christian? Do people really dislike him just because he has a football style from the 50’s and has a windup throwing motion…or is it because he brings conviction, truth, and religiosity to a game where many would say those things don’t belong? And why is Tim Tebow criticized more than a receiver kneeling down after a touchdown, or a quarterback pointing to the heavens, or a baseball player crossing himself before he gets to the plate? My answer…I think it is because we know he is real, he represents the gospel message, and that message is offensive to the media and to an unbelieving nation. It reminds me of what Christ said in Matthew 5…”Blessed are you when people insult you, persecute you and falsely say all kinds of evil against you because of me. Rejoice and be glad, because great is your reward in heaven, for in the same way they persecuted the prophets who were before you.” Key word in this passage is “when”, which tell us that as Christians we will face this type of opposition…and that is what Tebow is facing right now. So, Tim Tebow, rejoice and be glad in those that criticize you. You may not play for team I love, but you play for the God I love. And that makes me root for you more. I hope you do keep running over linebackers, and winning ugly games in the last minute. But in the end, I pray right now that you don’t fumble your testimony, and you keep winning hearts for Jesus Christ. Tim Tebow may drive the media crazy, but I have to say, I’m becoming a big fan.